On January 6, 2009 there were 1014 potentially hazardous asteroids. On February 2, 2009, there were 1019 potentially hazardous asteroids. On March 2nd, there were 1033 potentially hazardous asteroids. On April 1st, there were 1049 potentially hazardous asteroids. On April 8th, there were 1050 potentially hazardous asteroids. On May 3, there were 1054 potentially hazardous asteroids. course with our planet, although astronomers are finding new ones all the time. On April 8, 2009 there were 1050 potentially hazardous asteroids. of the asteroid on the date of closest approach. On May 3, 2009 there were 1054 potentially hazardous asteroids. May 29, 2009: An international panel of experts led by NOAA and sponsored by NASA has released a new prediction for the next solar cycle. Solar Cycle 24 will peak, they say, in May 2013 with a below-average number of sunspots. "If our prediction is correct, Solar Cycle 24 will have a peak sunspot number of 90, the lowest of any cycle since 1928 when Solar Cycle 16 peaked at 78," says panel chairman Doug Biesecker of the NOAA Space Weather Prediction Center. Right: A solar flare observed in Dec. 2006 by NOAA's GOES-13 satellite. It is tempting to describe such a cycle as "weak" or "mild," but that could give the wrong impression. "Even a below-average cycle is capable of producing severe space weather," points out Biesecker. "The great geomagnetic storm of 1859, for instance, occurred during a solar cycle of about the same size we’re predicting for 2013." The 1859 storm--known as the "Carrington Event" after astronomer Richard Carrington who witnessed the instigating solar flare--electrified transmission cables, set fires in telegraph offices, and produced Northern Lights so bright that people could read newspapers by their red and green glow. A recent report by the National Academy of Sciences found that if a similar storm occurred today, it could cause $1 to 2 trillion in damages to society's high-tech infrastructure and require four to ten years for complete recovery. For comparison, Hurricane Katrina caused "only" $80 to 125 billion in damage. The latest forecast revises an earlier prediction issued in 2007. At that time, a sharply divided panel believed solar minimum would come in March 2008 followed by either a strong solar maximum in 2011 or a weak solar maximum in 2012. Competing models gave different answers, and researchers were eager for the sun to reveal which was correct. "It turns out that none of our models were totally correct," says Dean Pesnell of the Goddard Space Flight Center, NASA's lead representative on the panel. "The sun is behaving in an unexpected and very interesting way." Researchers have known about the solar cycle since the mid-1800s. Graphs of sunspot numbers resemble a roller coaster, going up and down with an approximately 11-year period. At first glance, it looks like a regular pattern, but predicting the peaks and valleys has proven troublesome. Cycles vary in length from about 9 to 14 years. Some peaks are high, others low. The valleys are usually brief, lasting only a couple of years, but sometimes they stretch out much longer. In the 17th century the sun plunged into a 70-year period of spotlessness known as the Maunder Minimum that still baffles scientists. Right now, the solar cycle is in a valley--the deepest of the past century. In 2008 and 2009, the sun set Space Age records for low sunspot counts, weak solar wind, and low solar irradiance. The sun has gone more than two years without a significant solar flare. "In our professional careers, we've never seen anything quite like it," says Pesnell. "Solar minimum has lasted far beyond the date we predicted in 2007." In recent months, however, the sun has begun to show timorous signs of life. Small sunspots and "proto-sunspots" are popping up with increasing frequency. Enormous currents of plasma on the sun’s surface ("zonal flows") are gaining strength and slowly drifting toward the sun’s equator. 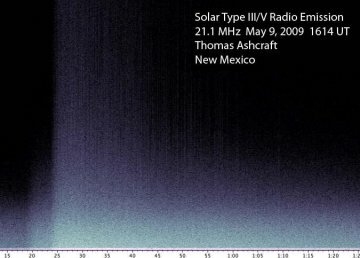 Radio astronomers have detected a tiny but significant uptick in solar radio emissions. All these things are precursors of an awakening Solar Cycle 24 and form the basis for the panel's new, almost unanimous forecast. According to the forecast, the sun should remain generally calm for at least another year. From a research point of view, that's good news because solar minimum has proven to be more interesting than anyone imagined. Low solar activity has a profound effect on Earth’s atmosphere, allowing it to cool and contract. Space junk accumulates in Earth orbit because there is less aerodynamic drag. The becalmed solar wind whips up fewer magnetic storms around Earth's poles. Cosmic rays that are normally pushed back by solar wind instead intrude on the near-Earth environment. There are other side-effects, too, that can be studied only so long as the sun remains quiet. Meanwhile, the sun pays little heed to human committees. There could be more surprises, panelists acknowledge, and more revisions to the forecast. "Go ahead and mark your calendar for May 2013," says Pesnell. "But use a pencil." The high-latitude of the region suggests it is a manifestation of new Solar Cycle 24. If so, this would continue a May trend of intensifying new-cycle activity. The active region is probably a proto-sunspot--a knot of magnetism struggling to form a fully-realized dark core. We'll know for sure in the next day or so when the hot spot turns to face Earth. Readers with solar telescopes, point your optics at the northeastern limb. The magnetic polarity of the sunspot identifies it as a member of new Solar Cycle 24, which forecasters expect to peak in May 2013. That makes this little spot a herald of things to come. Readers with solar telescopes, take a look; today you can see sunspot genesis in action. 5-22-09 sunspot appears - see 5-23-09 for more pictures. They are calling this sunspot 11, though the last one was number 12. DARK FILAMENT: Astronomers are monitoring a dark filament of magnetism on the sun. 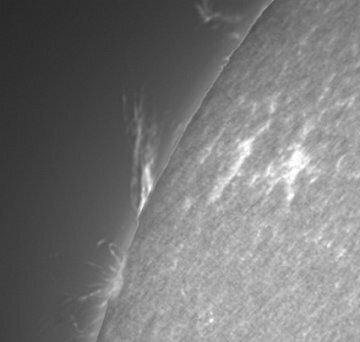 "The filament is very dynamic and a tremendous amount of detail can be seen," reports observer Pete Lawrence. He made this movie and took the picture below using a SolarScope SF-70 at his backyard observatory in Selsey UK. The dark material in the filament is a mixture of hydrogen and helium gas, seemingly dark because it is cooler than the inferno below. In fact, if you could hold the filament up against the night sky, it would glow fiery red with the luminosity of a full Moon, Sometimes filaments become unstable and collapse. When they crash down onto the surface of the sun, the result is a type of solar flare called a Hyder flare. So far this filament is holding steady, which means you still have time to observe it. Readers with solar telescopes, point your optics here. 5-19-09 Sunspot 1017 - They are numbering this sunspot #14 Note: I have no idea why the number changed from when it started. HUBBLE CAPTURED: "Hubble has arrived onboard Atlantis!" That was the enthusiastic radio message shuttle astronauts sent to Houston at 1:14 pm EDT today after they had grappled Hubble using the shuttle's robotic arm and started the process of berthing the telescope in the shuttle's payload bay. 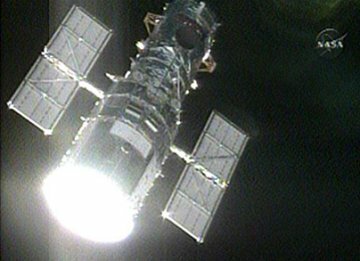 The successful capture of Hubble sets the stage for servicing. In the days ahead, astronauts will conduct five spacewalks to repair and upgrade the telescope, extending Hubble's operational life until at least 2014. Both Atlantis and Hubble are visible to the unaided eye when they pass overhead in the night sky. Check the Simple Satellite Tracker to see if you are favored with a flyby. "On May 13, 2009, at 12:30pm local time, the sun was directly above our heads in Pune, causing shadows to disappear," he explains. In the language of astronomy, the declination of the sun was +18.4 degrees, precisely equal to the latitude of Pune. "This phenomenon occurs twice a year, once in Spring when the sun passes overhead going north, and again in Summer (July 30th) when it returns to the south." Tomorrow, May 14th, noon shadows will return to Pune, but they will disappear somewhere else as the sun continues its springtime journey north. If the latitude of your hometown happens to be +18.6 degrees, go outside on and look for your shadow. Hint: Look underfoot. Sylvain Weiller took the picture this morning from his backyard observatory in Saint Rémy lès Chevreuse, France. "I used a Colorado SolarMax90," he says. That is an "H-alpha" telescope tuned to the red glow of solar hydrogen. The active region could be a "proto-sunspot"--a sunspot struggling to form, but not quite able to organize its own magnetic fields into a coherent, dark core. Or it could be a "sunspot corpse"--the decaying remains of a farside sunspot turning toward Earth at the end of its short life. Whatever it is, its magnetic polarity identifies it as a member of new Solar Cycle 24--and that makes it a sign of things to come. SATELLITE COLLISION: On Feb. 10th, 2009, Iridium 33 collided with Cosmos 2251 over northern Siberia, and the two satellites were shattered. US Strategic command has since catalogued 981 pieces of debris, 25 of which have already reentered Earth's atmosphere. On this three-month anniversary of the collision, veteran satellite observer Daniel Deak has prepared a set of 3D orbital debris maps. Broswe the links to see where the fragments are located on May 10, 2009: Iridium 33: #1, #2, #3, Cosmos 2251: #1, #2, #3. BONUS: A large piece of Iridium 33 wreckage is visible to the naked eye as it tumbles through the night sky flashing every 4.7 seconds. Check the Simple Satellite Tracker for flyby times. The loud swishing sound you just heard is a combo Type III-Type V solar radio burst caused by electron beams moving through the sun's outer atmosphere. The source of the electrons is probably an active region now emerging over the sun's eastern limb. The unnumbered region is crackling with low-level A- and B-class solar flares, and it could produce more radio sounds in the days ahead. Ham radio operators, point your Yagis toward the sun! NOTE: Wonder what happened to the scary scenario that the scientists came up with toward the end of cycle 23 that said it was going to be the worst ever and would kill all the satellites, etc. 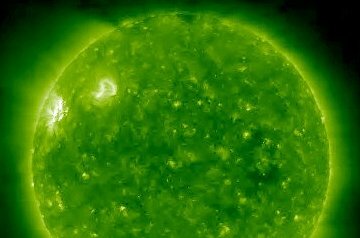 May 8, 2009: A new active period of Earth-threatening solar storms will be the weakest since 1928 and its peak is still four years away, after a slow start last December, predicts an international panel of experts led by NOAA's Space Weather Prediction Center. Even so, Earth could get hit by a devastating solar storm at any time, with potential damages from the most severe level of storm exceeding $1 trillion. NASA funds the prediction panel. 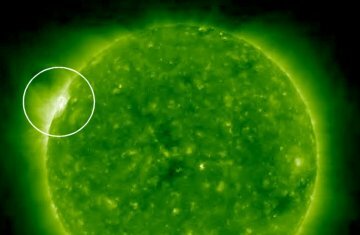 Solar storms are eruptions of energy and matter that escape from the sun and may head toward Earth, where even a weak storm can damage satellites and power grids, disrupting communications, the electric power supply and GPS. A single strong blast of solar wind can threaten national security, transportation, financial services and other essential functions. The panel predicts the upcoming Solar Cycle 24 will peak in May 2013 with a daily sunspot number of 90. If the prediction proves true, Solar Cycle 24 will be the weakest cycle since number 16, which peaked at 78 daily sunspots in 1928, and ninth weakest since the 1750s, when numbered cycles began. 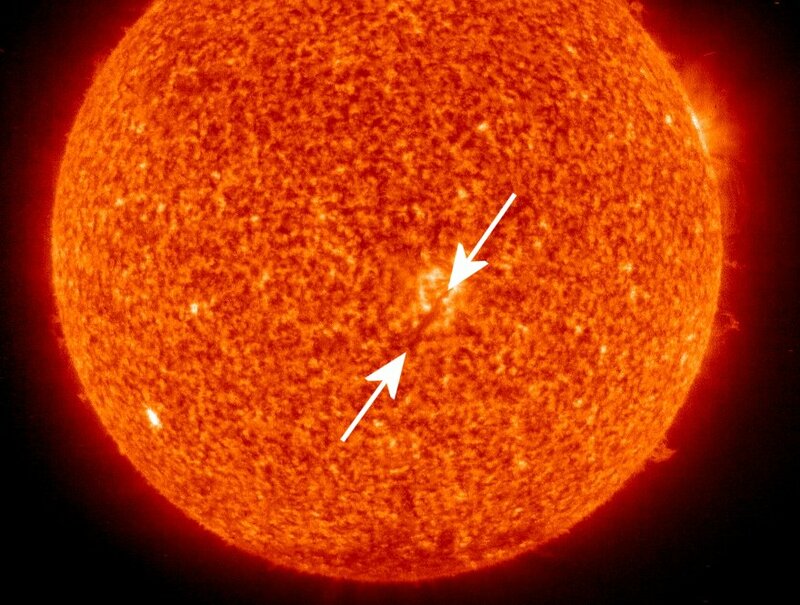 The most common measure of a solar cycle’s intensity is the number of sunspots—Earth-sized blotches on the sun marking areas of heightened magnetic activity. The more sunspots there are, the more likely it is that solar storms will occur, but a major storm can occur at any time. "As with hurricanes, whether a cycle is active or weak refers to the number of storms, but everyone needs to remember it only takes one powerful storm to cause expensive problems," said NOAA scientist Doug Biesecker, who chairs the panel. "The strongest solar storm on record occurred in 1859 during another below-average cycle similar to the one we are predicting." The 1859 storm shorted out telegraph wires, causing fires in North America and Europe, sent readings of Earth's magnetic field soaring, and produced northern lights so bright that people read newspapers by their light. A recent report by the National Academy of Sciences found that if a storm that severe occurred today, it could cause $1-2 trillion in damages the first year and require four to ten years for recovery, compared to $80-125 billion that resulted from Hurricane Katrina. cycles—or solar minimum—occurred in December 2008, marking the end of Cycle 23 and the start of Cycle 24. If the December prediction holds up, at 12 years and seven months Solar Cycle 23 will be the longest since 1823 and the third longest since 1755. Solar cycles span 11 years on average, from minimum to minimum. An unusually long, deep lull in sunspots led the panel to revise its 2007 prediction that the next cycle of solar storms would start in March 2008 and peak in late 2011 or mid-2012. The persistence of a quiet sun since the last prediction has led the panel to a consensus that the next cycle will be "moderately weak." NOAA's Space Weather Prediction Center (SWPC) is the nation's first alert of solar activity and its effects on Earth. The Center's space weather experts issue outlooks for the next 11-year solar cycle and warn of storms occurring on the Sun that could impact Earth. SWPC is also the world warning agency for the International Space Environment Service, a consortium of 12 member nations. As the world economy becomes more reliant on satellite-based communications and interlinked power grids, interest in solar activity has grown dramatically. In 2008 alone, SWPC acquired 1,700 new subscription customers for warnings, alerts, reports, and other products. Among the new customers are emergency managers, airlines, state transportation departments, oil companies, and nuclear power stations. SWPC's customers reside in 150 countries. "Our customer growth reflects today’s reality that all sectors of society are highly dependent on advanced, space-based technologies," said SWPC director Tom Bogdan. "Today every hiccup from the sun aimed at Earth has potential consequences." Lars Zielke took this picture on May 9th from his backyard observatory in Tvis, Denmark. 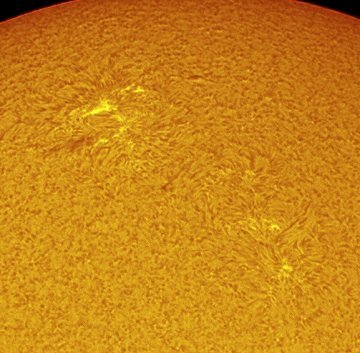 "I was lucky to get some images of the new active region just as it appeared over the sun's limb," he says. "In the background there were some very nice prominences, so the scene was set for a grand entrance." Zielka used a Lunt Ca-K solar telescope. "Ca-K" means the telescope is tuned to the purple glow of singly-ionized calcium. Such telescopes are sensitive to the magnetic froth that often surrounds sunspots and sunspot corpses. 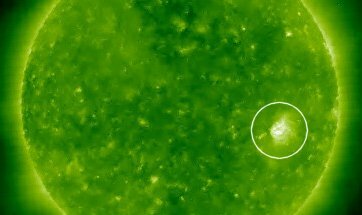 According to NASA's STEREO-B spacecraft, which is stationed over the sun's eastern limb, another active region should emerge today. Will it be a genuine sunspot--or another corpse? Stay tuned. On May 5th and 6th, magnetic fields in the vicinity of these regions erupted, hurling at least three coronal mass ejections (CMEs) into space. Since then, no explosions have been observed. 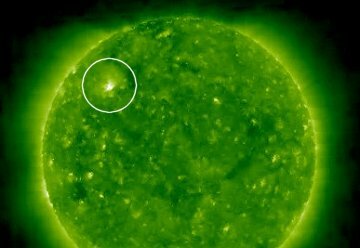 The sunspots probably located at the base of these active regions might be in decay--or they might be regrouping for a new round of CMEs. We'll find out when the sun's rotation turns the active zone toward Earth for a better view in the days ahead. 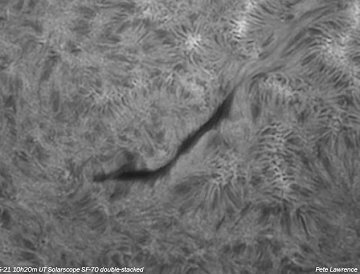 Readers with solar telescopes should train their optics on the eastern limb. HERE IS A MOVIE OF THE BLAST THAT CAME FROM THAT SPOT - YIKES!!! Forecasters expect the 2009 eta Aquarid shower to peak on Wednesday morning, May 6th, with as many as 85 meteors per hour over the southern hemisphere. Sky watchers in Australia, New Zealand, South America and southern Africa are favored. Rates in the northern hemisphere will be less, 20 to 30 per hour. The best time to look is during the moonless hour before local sunrise. That is when the shower's radiant is high in the sky and the nearly-full Moon will have set, leaving the sky dark for meteors. Eta Aquarids are flakes of dust from Halley's Comet, which last visited Earth in 1986. Although the comet is now far away, beyond the orbit of Uranus, it left behind a stream of dust. Earth passes through the stream twice a year in May and October. In May we have the eta Aquarid meteor shower, in October the Orionids. Both are caused by Halley's Comet. The shower is named after a 4th-magnitude star in the constellation Aquarius. The star has nothing to do with the meteor shower except that, coincidentally, meteors appear to emerge from a point nearby. 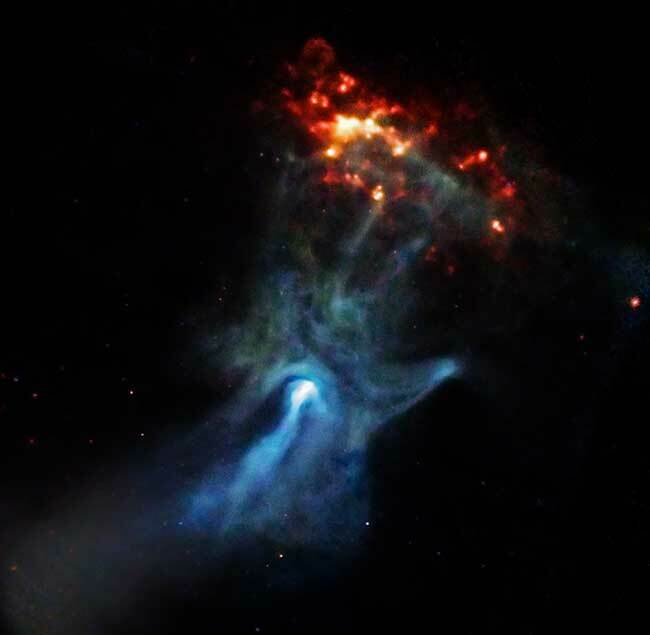 Eta Aquarii is 156 light years from Earth and 44 times more luminous than the Sun. Earthgrazers are meteors that skim horizontally through the upper atmosphere. They are slow and dramatic, streaking far across the sky. The best time to look for Earthgrazers is between 2:00 to 2:30 a.m. local time when Aquarius is just peeking above the horizon. Experienced meteor watchers suggest the following viewing strategy: Dress warmly. Bring a reclining chair, or spread a thick blanket over a flat spot of ground. Lie down and look up somewhat toward the east. Meteors can appear in any part of the sky, although their trails will point back toward Aquarius. Eta Aquarid meteoroids hit Earth's atmosphere traveling 66 km/s. Typical eta Aquarid meteors are as bright as a 3rd magnitude star. reach Earth on or about May 7th. 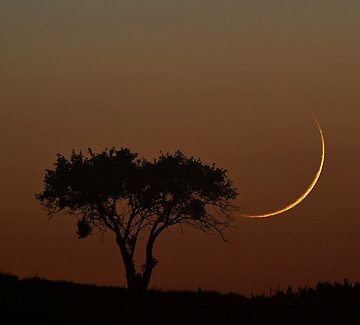 On Friday night, May 1st, a luminous X appeared on the Moon. "We saw it easily through our 5-inch telescope," report Enzo De Bernardini and Rodolfo Ferraiuolo of San Rafael, Argentina. You may have to stare at the picture for a moment to see the X. 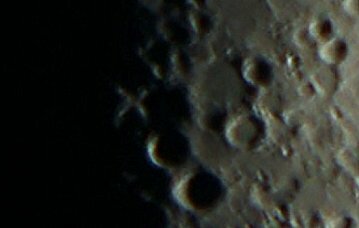 What is this "Lunar X"? Once a month when the sun rises over Crater Werner in the Moon's southern hemisphere, sunlight floods the region's high terrain and makes a luminous criss-cross shape. "Observing the X has little or no scientific value. It is a trick of the light. But the effect is striking, and it is exciting to rediscover each month," writes David Chapman in "A Fleeting Vision near Crater Werner" (Journal of the Royal Astronomical Society of Canada, Vol. 101, Issue 2, p.51). The next apparition: May 31, 2009. Mark your calendar with an X. An oddly shaped space boulder appears to show eye sockets and a nose leading to speculation it might be a Martian skull .At first glance it looks like a rocky desert - but this image of the Mars landscape has got space-gazers talking.An oddly shaped space boulder appears to show eye sockets and a nose leading to speculation it might be a Martian skull.One alien-spotter speculated: “The skull is 15 cm with binocular eyes 5 cm apart. The cranial capacity is approximately 1400 cc. ”There appears to be a narrow pointed small mouth, so this creature most likely is a carnivore.” Another joked: “The coronal ridge shows ample structure to support the musculature of antennae, although none are visible in this view.” The nose area is broad and blunted as you would expect to see in a cold and windy landscape. Is he decapitated or is he buried up to his neck?”Previous images of a skull spotted on Mars in 2006 were believed to have been the result of tampering.The famous Face on Mars, snapped by the Viking 1 spacecraft in 1976, which showed the shadowy likeness of a human face was late, was found to be a trick of the light when the area was re-photographed in 1998. SPACE WEATHER ON MERCURY: Is it any surprise? The planet closest to the sun is experiencing space weather events at a rate 10 times greater than anything we ever see on Earth. This is just one of several new findings about Mercury announced in the May 1st issue of Science magazine. Get the full story from Science@NASA. STEREO-A is stationed above the western limb of the sun. From that vantage point, the spacecraft can track sunspots for days after they leave the range of terrestrial telescopes. Back on Earth, the sunspot number has dropped to zero, but STEREO-A is still counting. So is the sun blank--or not? For more than 200 years, astronomers have counted spots on the Earth-facing side of the sun and called that the sunspot number. Farside spots couldn't be seen and didn't count. Continuing this tradition makes sense because it allows us to compare data across the centuries. So, today, the sun is officially blank even if STEREO-A knows better. Chris Kotsiopoulos took the picture on April 26th. 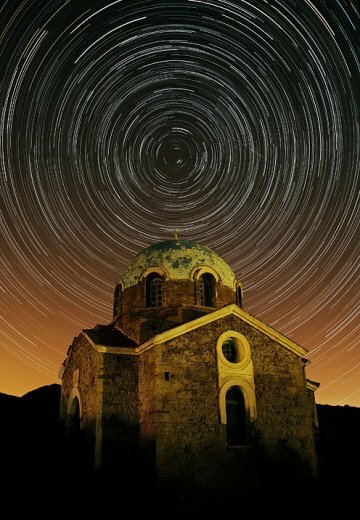 He placed his camera (a Canon Rebel XTi) motionless on a tripod in front of St. John's church in Sounio, Greece, and opened the shutter for almost three hours. The slow spinning of the planet beneath his feet caused the stars above to trail in graceful arcs around the north star, Polaris. A Curtin University student has found a new asteroid orbiting in our solar system, not far beyond Mars. Honours student Mick Todd discovered the 4km-wide rock while scanning the sky for dangerous nearby asteroids. The discovery is 300 million kilometres away. The object is part of the asteroid belt, a cloud of cosmic boulders between the orbits of Mars and Jupiter. After checking the asteroid against databases, Mr Todd realised it had never been spotted before. "It is a seething fury of plasma," he says. 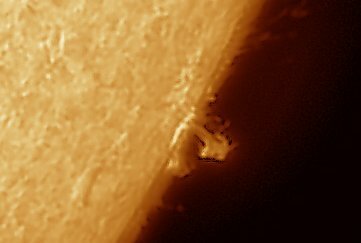 "My images captured a lovely, almost flower-like prominence ejected from the region." 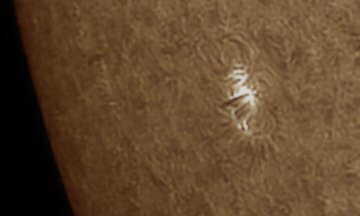 Readers, if you have a solar telescope, train it on the sun's western limb. Sunspot 1016 will be rounding the bend for the next 24 hours or so. Parting shots are welcomed.